Is it just me, or do I look a bit goofy in 60s hair? I think I'll skip that when I photograph my completed challenge. So here's the sketch. I'm not sure what I think--I'm not as in love with the drawing as I expected to be, but I think it's the hair and the fact that I couldn't figure out how the dress would work on my narrow shoulders--which is why I didn't draw in the brooch. Maybe I need to convert it from the set-in sleeve of the pattern to the kimono sleeve of the real Joan dress? And I'm still frustrated in my dickey fabric search. As you can see above, I got some random cheap poly chiffon that sorta works--but Joan just strikes me as a genuine silk charmeuse kind of woman. On another note... Thank you all again for the kind comments on my corduroy trousers! I'm sad to say that although they started out perfectly fitted they've continued to grow with wear and are now at least an inch or more too loose even in the elastic waistband. I'll see if they shrink up decently in the wash--if not, I'll take them in. Either way, they still fit better than all my other pants. So there, pants! 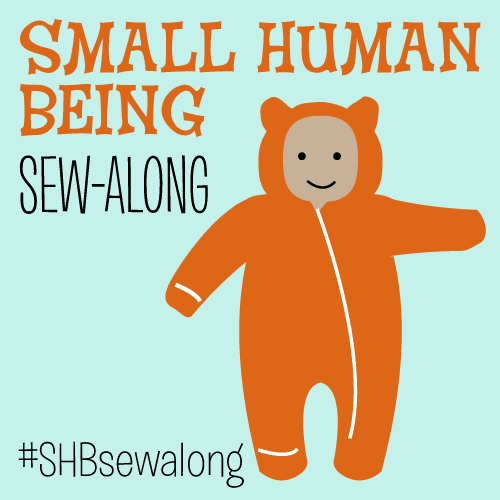 But that's what sewing's all about, right? Always something new to learn. How is it that so many of you watch television/movies while sewing? I pretty much missed the whole thing since I wanted to focus on not slicing off my fingers. I know full slips are usually on the bias, but why would a half-slip need to be on the bias? Will all my suffering be worth it? Do you think anyone will notice that the two rectangles I attempted to cut out look like parallelograms that have been chewed on by Cookie Monster? I swear those things would NOT square up, even with the help of the helpful woven-in dots on the fabric and a veritable army of rulers and T-squares. I've never worn a half slip, but since they're all bunchy and gathered around the waist--is that going to show under my super-tight Joan dress? But conversely, would the full Ruby Slip--which has something of an A-line skirt--look weird/visible under a pencil-skirted dress? I'm curious--I've only ever owned slips of the unbreathable nylon variety. And yes, a few of you pointed out that my croquis is now a bit larger than I am, since I drew her before an unintentional random weight loss (my food/movement habits haven't changed, so I believe it's due to my toddler nursing a lot during a recent growth spurt)... but I was too much in a rush to redraw her just for this. I don't know how people manage to watch tv while sewing either! I just listen to music or the radio, and even then I miss half of it because the sewing machine is pretty noisy. I'd wear a full slip with a dress like that because of the bulk at the waist problem. I do sometimes find the slip rucks up if I wear a long one under a stretchy fabric and makes visible lines, but I think that's when the slip is a bit too long. That colour and style are going to look awesome on you! I do watch TV (or listen to it really) when I sew. I usually play something on the computer that I missed during the week. I suppose it is a bit late now, seeing as how you've already cut it out, but I find with the slippery silk if I spray it very heavily with spray starch that helps quite a bit. It will not drape when you try it on as you go, but I've found at least the pieces don't grow or change shape as I handle them. I've never had an issue with the silk being ruined by the starch, but it would be a good idea to test a piece first. There is also this sew-along, and part way down page two there is a PDF with very thorough directions of working with silk on the bias. OK, now I've read and I have to say that the ruby bias cut slip, which I've made in silk charemeuse, would be just fine under the pencil skirt, IMO. It's not very flared, just a bit fluttery at the bottom. The only half slips I wear are made of some excellent modern mystery fabric and do not have any gathers at the waist. It's like a tube that hangs perfectly due to weights in the hem. In this case, I think that contemporary technique and textiles win. I don't know if it works because I haven't been able to source any in Western Canada yet, but I hope so! Silk is so lovely, if tricky. When working with slippery materials I starch the crap out of them. That helps a lot. As for the watching a movie while sewing...I can't do it either! I thought I was the only one! I think you look awesome in that dress and the 60's hair! Literally, my first thought upon seeing this post was "DAY-UM girl!". Makes me wish I had the figure for a Joan dress! I can't watch tv and sew either! But I love listening to podcasts. Lately I've been listening to stories, like The Tobolowsky Files, and The Moth. Even then, if what I'm working on is very challenging for me, suddenly I'll realize I haven't heard the last few minutes of the story and I'll have to back it up! I guess I'm more of a uni-tasker than a multi-tasker. I really like your croquis with 60's hair. I think you could pull it off if you wanted too, but there's something about a Joan dress with modern hair too. I think the full slip is the way to go--as fitted as the dress will be, even if there's no visible line from the elastic, I would think it'd be uncomfortable. I can't watch movies. For one, I like to get lost in the stories, and I feel crazy to work and watch because I'm only half invested in both places. I tried to watch Kung Fu Hustle with my hubs the other night while I was doing some research for swimsuit making, and I came away with no truly good ideas for a swimsuit and I'm pretty sure I missed some awesome kungfuness too. Sad. Way back when I had my sewing machine set up in the living room, I would sometimes watch TV while sewing. But not while cutting and definately not when working with silk or with anything bias cut! Those things need one's full attention. All fabrics stretch on the bias but silks madly so. In fact, your paralellograms may turn out just fine when sewn. One other thing though: did you try to draw those rectangles straight onto the silk, on the bias? That doesn't work. Too much stretch. In a stable fabric, on the straight grain, of course you can just draw a rectangle for a gathered skirt using a ruler and a set square but silk moves about too much. If you make a paper pattern piece, lay that onto your silk and trace it carefully, you don't have to put as much pressure on your fabric which helps it to stay in shape at least a bit more. Or use starch, like the other ladies suggested. And about those waistlines: (half)slip patterns vary. Most of those for fitted half slips I've seen are to be bias cut, but with shaped sides (as in some waist-to-hip shaping) and just a bit of excess fabric to be gathered by thin lingerie elastic at the waist. This creates very little bulk and the stretchy-ness of the bias cut still allows you to pull the slip over your hips. Between you and Oona, I now want a mini-me croquis. 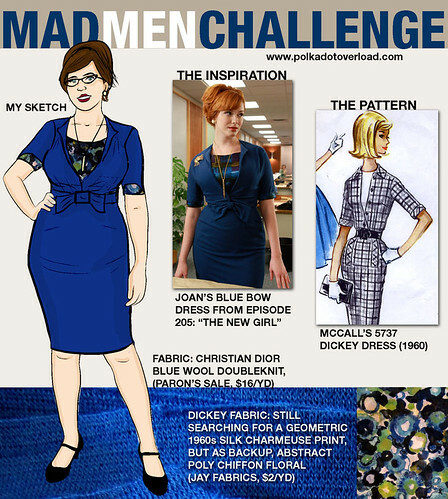 And, all of this Mad Men sewing has also had me going through my pattern stash. I was trying to stay away since I already have way too many projects going on right now, but it just looks like so much fun! Thank you all for the kind comments! Nadia, funny you should mention that--I just ordered some of that stabilizer spray from Vogue Fabrics and am waiting for it to arrive. The bias half slip isn't as much of a disaster as I feared--it's hanging unhemmed on my dress form now, and actually doesn't seem so lopsided. But I will be more careful in cutting bias next time (and follow Sherry's tips from the Ruby Slip sew-a-long). Still, I think you're all right that a full slip is more appropriate here. And maybe I WILL try 60s hair... if I can rock that, perhaps I can get the confidence to attempt 40s hair again, which was a total failure last time. I am so awful at doing hair. I think you are far more advanced than I am wrt sewing clothing but... when I took a class on making the Collette Cinnamon slip the biggest tip I took from that class was tracing our pattern onto freezer paper and ironing that to the fabric before we cut it out. Additionally Gertie just tweeted something this weekend about cutting bias garments with very large seam allowances. Food for thought. I think the croquis looks awesome by the way. Thank you very much Mikhaela for your superquick answer! Because I live in Belgium I could not watch the episode.. Good luck with your dress!